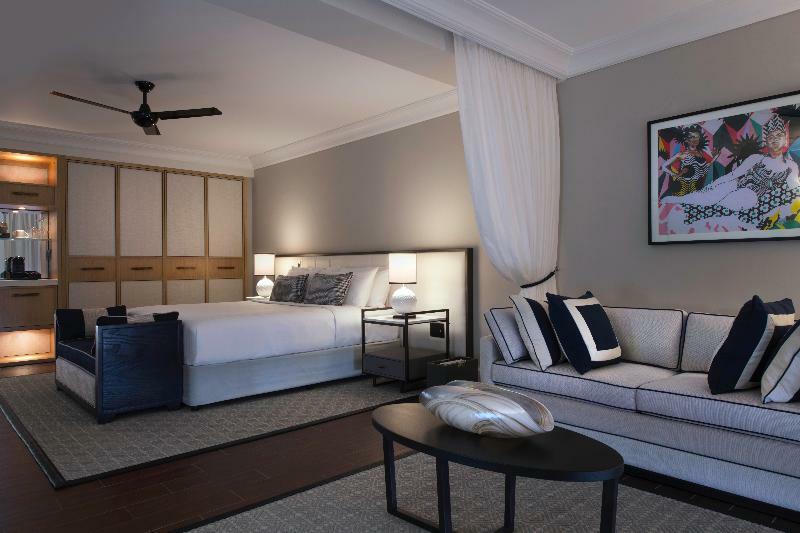 ﻿ Book Fairmont Royal Pavilion Barbados Resort, Porters (Saint James) - 2019 PRICES FROM $693! Set on the Glitter Bay Beach and 1.2 mi from Holetown City in St James, this complex features an extensive garden, in-room massage services, a swimming pool and free WiFi in all areas. The plantation-décor rooms and suites offer air conditioning, ceiling fan, seating area and a flat-screen satellite TV with DVD player. All accommodations include a balcony or terrace with sea views, and a private bathroom with bath and separated shower. The lobby and all the guest rooms and suites have been newly renovated on November 2017. The Fairmont Royal Pavilion Barbados Resort features 2 restaurants serving international and Caribbean cuisine. Private dinner and in-room dining facilities are available. Guests can also arrange activities as canoeing, diving, fishing and snorkeling. Among these amenities, there are available a gym, tennis courts, laptop loan, laundry and a gift shop. Certified baby sitting service with an extra charge can be arranged upon request of at least 24 hours prior guests need it. This complex is 5 minutes’ drive from the Royal Westmoreland Golf Course and 15 minutes’ drive from the Flower Forest. The Grantley Adams International Airport is 12 mi away. Other services such as Manager’s weekly cocktail reception, non-motorized water sports (kayaking, paddle boarding, hobie-cat sailing, snorkeling, swimming with the turtles, outdoor tennis courts are available. Reservations are necessary for DVD rental (Excludes in-room movie rentals). Children are welcome all year round and stay free of charge when sharing a room with their parents (Aged 12 years and under). Children 12 and under eat free when dining off the kids menu, and receive 50% discount when eating off the main menu. Daily kids activities and entertainment include kayaking, beach cricket, soccer, bajan sporting games, treasure hunts and movies. Guests are required to show a photo ID and credit card upon check-in. Please note that all Special Requests are subject to availability and additional charges may apply.